The Art of Evelyn Kok Gallery, formerly The Gallery of the Purple Fish, will re-open June 2018. Owned by Christina Shipps, Evelyn's niece, the gallery will offer Kok's original watercolors, drawings, bookmarks and ceramic pieces. Since Evelyn's death in 2013 Shipps has created an extensive line of greeting cards using original watercolor images and produced a book in 2017 titled "There Has To Be Magic, the life and art of Evelyn Kok" all of which will be available. Small antiques and collectibles from the Kok estate will also be offered. 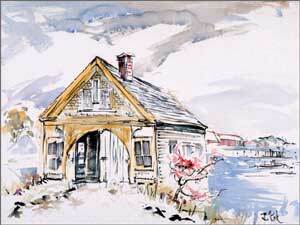 Come and enjoy this unique seaside gallery, an iconic Maine location right on Stonington Harbor. In 1970 she discovered Stonington Harbor on Deer Isle and purchased an old building on the waterfront, fondly dubbed "the Heap". The Heap evolved into the Gallery of the Purple Fish, a studio and living quarters where Evelyn and Jan spent their summers. Evelyn became enamored with the Maine windjammer fleet that frequently sailed into Stonington Harbor. She personalized bookmarks for the schooner passengers earning her the name "the bookmark lady of Stonington". A visitor could view her other art works but not purchase them, causing much consternation to countless people who visited her gallery. Evelyn's joy was people not profit. Evelyn passed away in 2014 leaving her lifetime collection of original art to her niece, Christina Shipps, to "deal with". The collection includes hundreds of fine watercolor paintings large and small, hundreds of pen & ink drawings, thousands of bookmarks. It is a daunting body of work dating back to her life drawing classes at art school. This website has been created to preserve Evelyn's memory for those people whose lives she touched, to make available some of her marvelous artworks and to delight those who never had the pleasure of experiencing this unique and magical person.